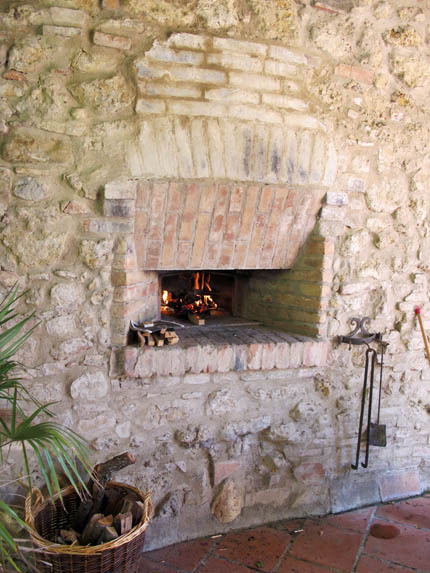 Wood Fired Oven in Italy, a Love Affair! Istanbul, Greece, Naples, Rome and all the stops between were beyond my wildest expectations, but this pizza oven is where I fell in love. I rented a particular house in Tuscany, not for its stunning views, or proximity to wine, cheese, olive oil, gelato, pasta, pastries, all of which were minutes away, but for this oven. 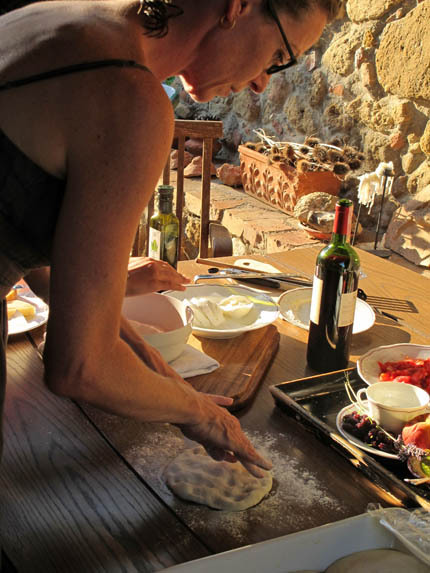 For the first three weeks of our journey we ate hundreds of pizzas and flatbreads, as research for our upcoming book on the subject, and now, in Tuscany I finally got back in the kitchen to do a little creating of my own. 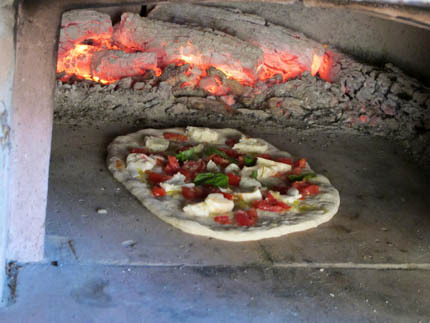 With a bit of help from David, our trusted culinary guide and keeper of the oven, I set out to bake pizza in Italy, an admittedly ballsy move. First David took me shopping in San Gimignano for all of the makings of my pizza party. The local cheese shop, where I couldn’t resist buying a slice of all the locally produced sheep cheese was our first stop. 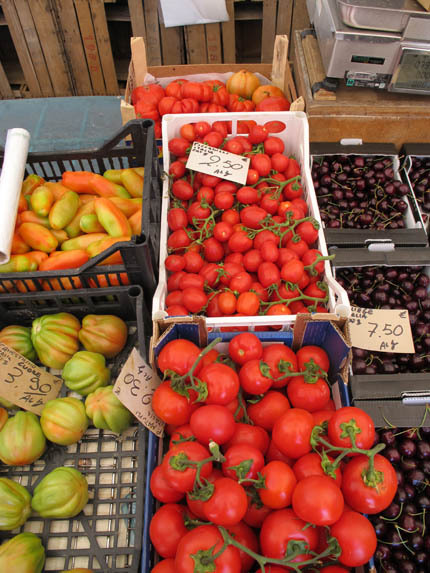 for the perfect tomatoes and squash, including the blossoms. stops at every pastry shop in town, I got busy creating. it all went together in minutes once David had the fire blasting hot. There was no equipment equipment to speak of, so I stretched the dough by hand, used a wooden cutting board to slide the pizzas in the oven instead of a proper Pizza Peel, which meant sticking my hands deeper into the 800 degree oven than is advisable. 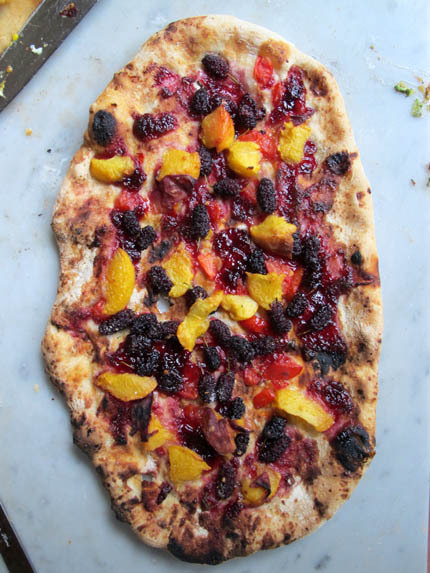 Here are a few of the pizzas I made, which will all make an appearance in our book Pizza and Flatbread in Five Minutes a Day, which I hope you will love as much as we have loved creating it. Some pizzas will be traditional and some will be combinations Jeff and I have dreamed up. We hope they become a tradition in your home. 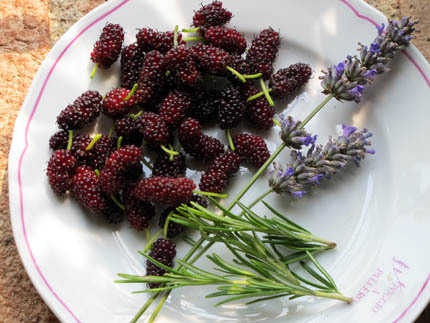 Some will be with seasonal ingredients like these berries, lavender and rosemary I picked from David’s garden just before throwing them on a pizza. Best of all, baking home made pizzas makes you incredibly popular. 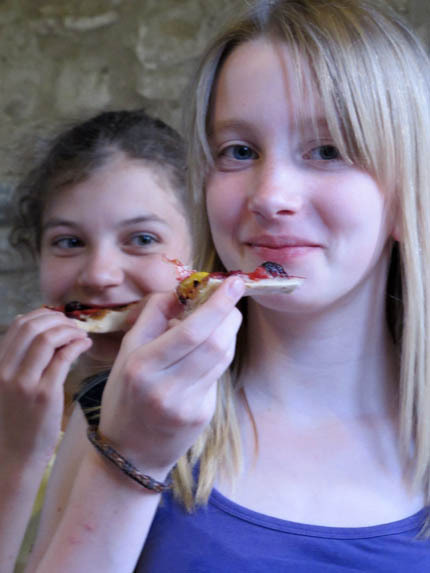 These two adorable girls were also on holiday in Tuscany and joined us as soon as they smelled pizza. In German/English they told me how much they loved the pizza. That makes me very happy. We are now in the testing, photographing and editing phases of Pizza and Flatbread in Five Minutes a Day, which will be out the fall of 2011. Looks like good pizza. Is a white flour dough the secret for a crispy crust? I also have an unrelated question. Have you ever made baked donuts with your dough? Do you think it is possible? We will unveil all of our pizza discoveries in our book. You can get great crust from a bunch of different doughs, just depends on what you are in the mood for. You can bake the brioche dough in rings and get a wonderful cakey doughnut. I will plan to do a post on that soon. Hmmm, you got Europe and wood-fired ovens and Jeff got . . . his backyard BBQ. Poor Jeff! ABin5 suggests lean doughs for pita, but I finally had success (first time ever) with the olive oil dough. Yum! So nice to be able to whip up some pita for a leftover lamb sandwhich tomorrow. Mmm. Can’t wait till the new book. I grew up with my dad who made his own pizza and was a pizza connoisseur. Now I’ve been making pizza all the time, and with your dough it is really convenient. Bill – I actually find that the whole wheat 5 min doughs make crispier crusts. I par bake them for 5 min before putting the toppings on. I had my first brick oven pizza and flatbread while on vacation this summer. There was a restaurant that made certified Italian flatbreads and pizzas. The fun thing is that the oven was right near the dining room so my kids got to make their own pizzas and then watch them bake in the oven. Sure wish I could have one but will just need to get a stone or pan that I can use on my grill. What can I say? There can’t be anything better on this Earth than eating wood fired pizza made from the freshest ingredients, and made in the most perfect setting. Except sharing it with friends, new friends, and family! I can’t believe I have to wait a whole year for this book to come out! I can’t wait! My but don’t those pizzas look delicious! I can’t wait for your new book to be released. I love pizza. 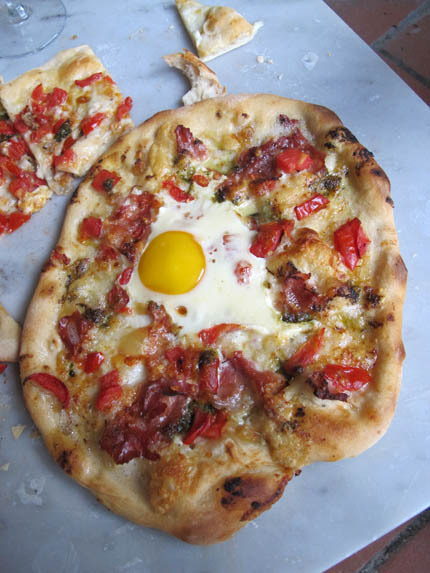 I hope you will include a Flammkuchen recipe in your 3rd book. It’s a German pizza with a sour creamish sauce instead of pizza sauce. It was so delicious! Thank you for the suggestion, this is a new one to me, I’ll have to look into it, sounds tasty! Good luck convincing your wife, she will be so glad you did! Just made my first loaf this afternoon (okay, last night was the first but I don’t count it since I used the wrong flour, yeast and salt – and it showed). Came out beautifully. I am so excited for this book! We have a wood burning brick pizza oven in our kitchen and use it all the time. 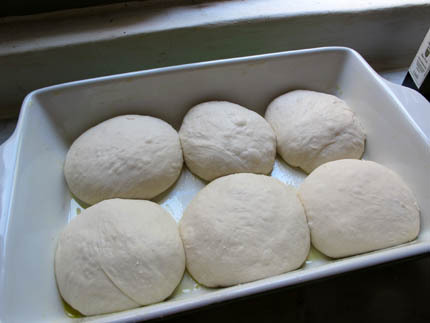 I have tried your dough for pizza…it was a little wet, but worked well after a lot of flour added for stretching it out. Is there anything special you did for your pizza over there or just the regular dough recipe? I really want to start trying some breads, etc. in there as it gets cooler (it does get a little warm using it indoors in the summer). Did you try regular breads there or just pizzas? And for those of you thinking about putting a pizza oven in your backyard or home, it’s well worth it! We got ours from a chef in California who sells them and then my husband put ours together and finished it when we were building the house. I have baked our breads in a wood oven and they came out wonderfully. In fact, I was baking with a traditional baker and he ended up liking my baguettes better! 😉 I baked the loaves under a metal pan for the first 10 minutes to get a nice crust, then removed it to get the color and flavor from the wood. Loved it! What about times? And did you test the temperature of the oven at all? We have an ability to test how hot the floor of the oven is and when we do pizza it’s about 700 degrees or so. Do you need to do bread at a cooler temperature. We have had the oven for a few years now and it is amazing!!!! Talk about creativity in pizza toppings! I just haven’t ventured much from pizza in the baking department, though. We use Brazilian soap stone for some of the cooking in it and it works really well. I vote for flammekueche! French friends in the Alsace region took us to a restaurant that only serves flammekueche and brings them to your table until you say no more! All for one price. 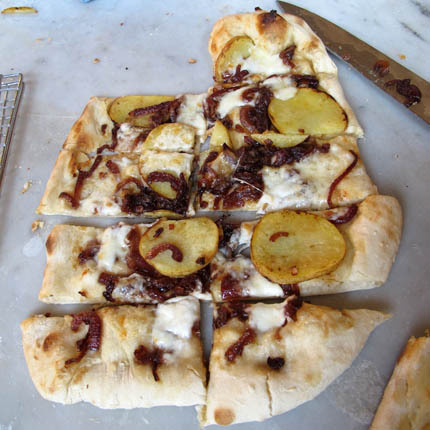 Creme fraiche, onions and bacon on a thin crust, yummy! waiting for the book to come out. i love the flat bread to eat daily. Diann: I know that Zoe didn’t have a thermometer, but I’d guess that she assumed that this was about 800 F, as she says above. That’s what Italian regulations call for when making Neapolitan pizza, and at that temperature, a thin-crusted pizza (1/8-inch thick) is done in about 90 seconds. If yours is taking longer, it’s not 800 degrees. At our house, rye dough is a favorite for pizza crust. 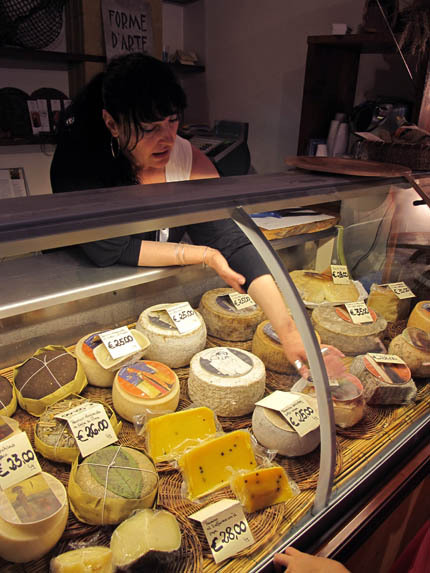 It handles really strong or sharp cheeses well. 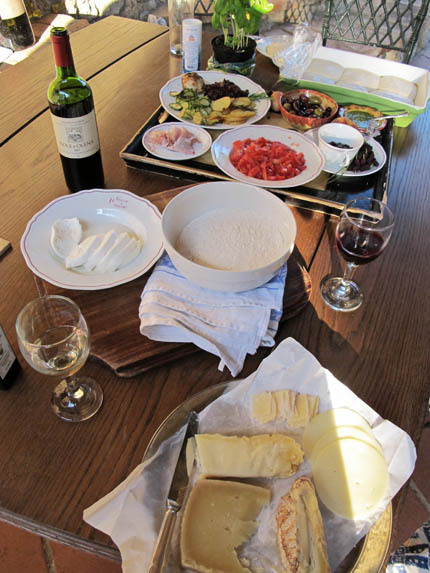 It is also a nice complement for sausage or marinated meats (since we’re usually using up leftovers from the fridge.) And the rest of the ingredients come from our garden, so they have plenty of flavor. 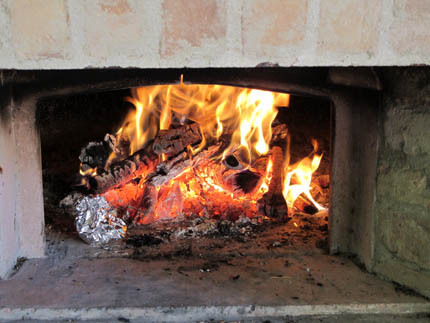 Hi Zoe, We would love to help inspire you to build your own backyard oven. Our mutual friend, Lisa told me you were interested to see what we have done. Please know you are welcome to stop over to see it any time. Is there any way to par bake your rolls and then finish them off in a hot oven.?? All of our loaves can be parbaked and then finished later. The rule of thumb is to bake them about 90% of the way, just before they get their final color and then take them out of the oven and cool completely. Wrap the loaf really well and freeze until you are ready to heat and serve. With the smaller rolls you can just take them from the oven and bake until nicely browned. I just let them sit on the counter while I preheat the oven, still wrapped and then arrange them on a cookie sheet right before going into the oven. bake for about 10-15 minutes, depending on the size. I have a question about shaping. Typically how long after forming the basic boule does it take for the dough to relax? I find that transforming the boule to a flatbread or baguette takes a lot of work, and I fear this is making the finished product denser than it should be. Another question. Typically how long does it take for the loaf to take its final form? I would like to take the loaf off the stone and place it directly on the rack, to try to get a good color and crust on the bottom. Is that the right idea? Bill: Doing a really skinny baguette can take a while. It’s a finer point of great baking, but if you’re really going for a perfect result and avoid denseness from over-handling, you should rest the baguette as soon as you feel it starts resisting. Five minutes should do it, 10 at the most. When you return, a lot of the work will have been done for you. Might have to repeat once or twice. This slows you down, but gives a more authentic result. It takes anywhere from 5 to 15 minutes to get this to happen (I’m frequently impatient and tolerate a thick-ish baguette). First time caller (writer? ), long time fan, and have enjoyed all your recipes I have tried so far. Thank you for sharing your pizza adventures with us–I love pizza in all its forms and am really excited that you’ll be publishing a book about it. Thank you very, very much!!!! I may have missed this in your website but what is the ETA on the release of your new pizza cookbook? Tupperware FridgeSmart Large Round is 5 quart and vented. Sounds PERFECT for the basic recipe in Mother Earth News. I’m picking mine up on Friday. Can’t wait! I mixed my first batch in my KitchenAid 5 quart stand mixer bowl and made the mistake of putting the whole thing in the fridge. I discovered the next day (yesterday) that a lot of the flour had not incorporated and my dough is too soft. I went ahead and baked a loaf but it spread out and ended up about 2 inches high and quite wide. I don’t want to mix the dryish flour in now and lose all the good air in the dough, so I’m going to try baking it in a pan. Wish me luck! Hi, Recently received a copy of your artisian bread in 5 min a day from friends in USA. I”ve tried one batch while it tasted pretty good I think my mix was too dry. it may also not have had enough yeast I think the problem is that here in Australia we use metric measure, and I had some trouble converting. Also the names of some things are different, we don’t ahve anything called all purpose flour, I think our plain unbleached flour might be about the same, I presume what we call wholemeal flour is similar to your whole wheat flour. I also can’t find anything called cornmeal. The only yeast I can get is dried yeast in 7gm sachets, so how many should I use, our cup measure is 250gm and tblsp is 20ml. 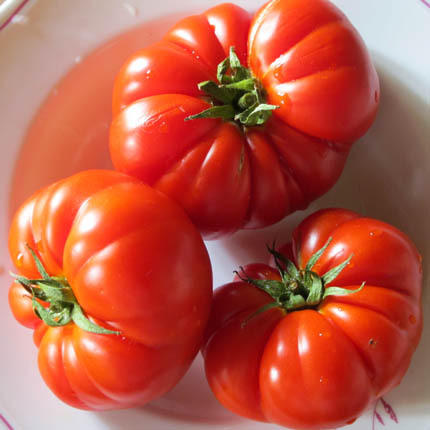 do you have a metric recipe, finally I’m on a low salt diet, how much can I reduce the salt? Wow! These pictures look amazing. Have to admit, I havn’t been baking much as the summers in Israel are so long and hot that I just cannot bring myself to turn on the oven. But now that the weather is beginning to cool down a bit there is nothing we like better than a fresh loaf of bread for a leisurely Saturday breakfast. I love your method and every recipe I tried turned out delicious. My only problem was that the loaves did not rise much and they tend to spread sideways. Should I, maybe, use a little less water? (I follow the recipes excactly but I do use only 3/4 tbls of yeast). Ornit: Less water may help (1/4 cup, let’s say). The yeast decrease isn’t a problem, I’m sure you’ve read our FAQ on that? looks great! looking forward to the new book. Until then I have a pizza question. I’ve been using the basic dough recipe (sometimes with 25% whole wheat flour) and have gotten great results with the boule, nan, etc, but when I make pizza the problem I’m having is that often the cheese will brown on top before the crust is brown and crisp. I’ve tried regulating oven temperature & time and tried varying amounts of toppings but to no avail. The pizza is still tasty, but I’d love a crisper crust. Any suggestions? Adam: Publisher will kill us if we put the 3rd book out here in detail. All I can say for now is: lower shelf in the oven, and longer preheat of the stone. This has nothing to do with this post but I have a question. I’ve noticed that when I make 100% whole wheat doughs (for bagels, cinnamon rolls, breads, etc) they come out GREAT when I use the dough setting on my breadmaker. They rise very well and are never dense (although a little gluten sure does help) anyways I have made a couple of the recipes in your book that I just got and tried substituting all whole wheat flour in them, still using your 5-minute method. When I substituted all whole wheat in my bread machine doughs they turn out just fine but with this other method I seem to have no luck and have made dense bread that fails to rise much. I attribute my success using the bread machine to it’s kneading skills, but I know that these recipes in your book are “NO KNEAD” so my question is, can I use these recipe ingredients but put them in my bread machine instead of the 5 minute method on the dough setting? Is it possible to bake these breads, any of your breads, using a professional pizza oven? What kind of pizza oven do you mean? A deck oven or wood or conveyor? I just got around to trying your spelt/olive bread. I used a thick Greek yogurt and some olive paste (rather than chopping lives by hand). It is the most delicious bread! really, the texture, taste and crumb are extraordinary. I may try to make some baguettes out of it, too. Thank you for such a delicious recipe. I knew exactly what you meant! 😉 Thank you so much for the feedback! Thanks Jeff, I will experiment a bit. I’ll try decreasing water with my regular flour and will also try using a different brand of flour with the regular amount of water. Hi– I’m trying out the Cracked Wheat Bread in Healthy Bread, and I have a question. The recipe intro says “blending crunchy cracked wheat with white whole wheat and traditional whole wheat,” but the recipe itself calls for the first 2, but unbleached all-purpose flour, not traditional whole wheat. Should it be as the intro says, or the recipe? I’d like to try it with whole wheat instead of unbleached next time, if that would work. Thanks! Theresa: Sorry for the confusion… WWW and ordinary WW are interchangeable in this recipe, though the flavor and appearance change, they both work well. Originally we were going to use WWW and WW as a mixture but ended up liking it better with all WWW as the whole grain flour component. The AP flour lightens this recipe up and we thought really improves it. Hi Zoe, A deck pizza oven – I was wondering if I could get someone at a pizza store to bake a bunch of loaves for me to give away at Thanksgiving and/or for the church gatherings. I have some masa harina flour, but I don’t have normal cornmeal. Would masa harina work for the Anadama Corn Bread recipe from HBi5? I don’t know what to use the masa harina for other than tortillas. 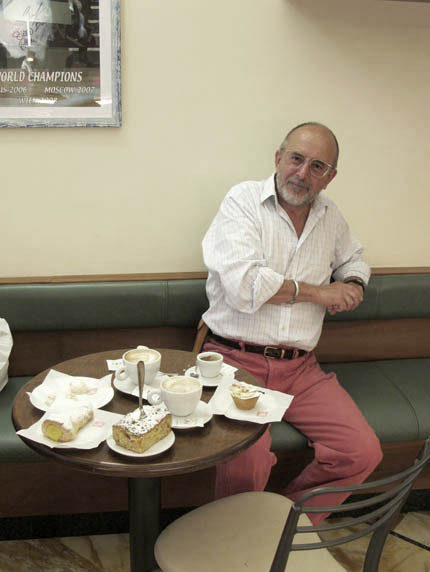 I love your books and I am delighted to see the gluten-free recipes. Are you going to have more of them in your new book? Can some of your other recipes be adapted? Yes, we are going to have some G-F options in our pizza and flatbread book. So glad you are enjoying the breads! It is not really possible to adapt wheat recipes to g-f because they rely on different ingredients to create their structure. Thanx Jeff. I baked all of my wettish dough in pans and wanted to post that they do need a lot more time in the oven. I took mine out to soon and realized too late that they would have been better with additional baking. They did not go to waste, only to waist! Wow! This is awesome. I’ll definitely be getting this new book. The caramelized onion and potato one looks incredible. What a beautiful place you stayed at. Could you tell me the name of the place you stayed with the woodfire oven in the house. It was a lovely place, but I don’t think they are renting it anymore. I can’t seem to find their listing. If I find out otherwise I will post the name. Pizza Stones – which creates the best crust?